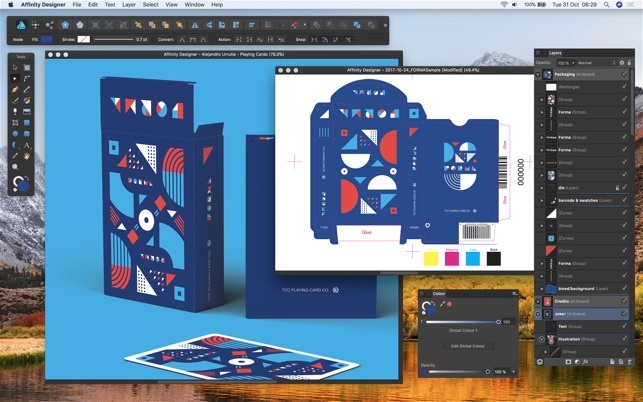 Professional Graphic Design Software for the Mac. 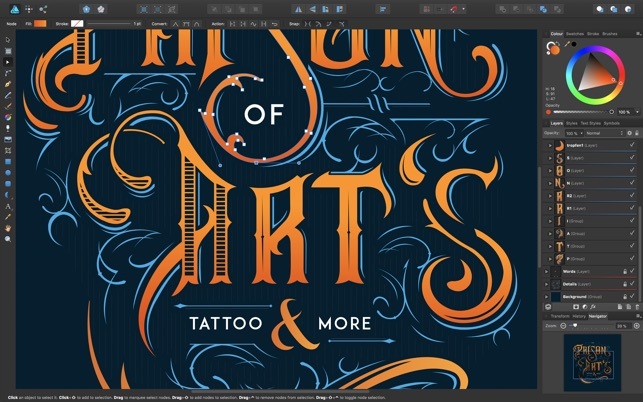 Affinity Designer is the fastest, smoothest, most precise vector graphic design software available. 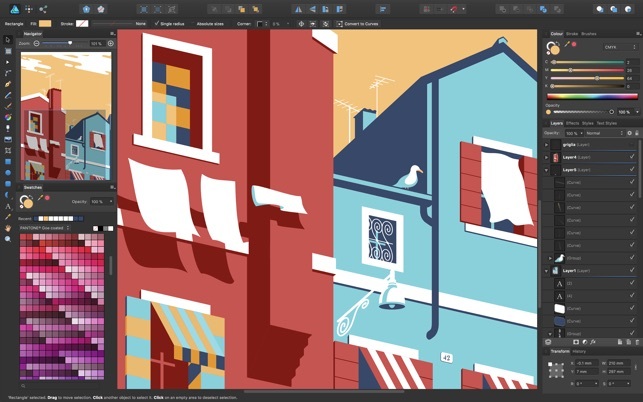 Whether you’re working on graphics for marketing materials, websites, icons, UI design or just like creating cool concept art, Affinity Designer will revolutionize how you work. It takes full advantage of macOS technologies such as OpenGL, Grand Central Dispatch, Core Graphics and is fully optimized for 64-bit and multi-core processors to squeeze every ounce of available performance from your hardware – so it’s seriously fast. Whether it’s a 100 megapixel image or the most complex vector drawing with thousands of curves, you still pan and zoom at 60fps, move objects in correct z-order and see live views of all adjustments, brushes and effects as you’re working with no compromise. Experience the best PSD import engine out there – making it easy to collaborate with other creative professionals. Along with support for PSD, PDF, SVG, AI (PDF Stream), Freehand and EPS files you get all the flexibility you need so whether you switch to Affinity Designer for all your work, or just elements of what you do, it’s completely painless. 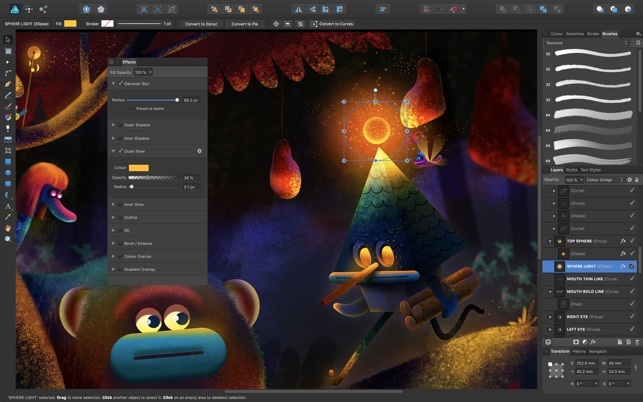 With professional color model support, full 16-bit per channel editing, real-time pixel preview, image slices, masks, adjustment layers and tablet support, Affinity Designer is a serious tool for creative professionals. • High quality raster tools for texturing, masking and finishing artwork. Create your own brushes too. - Improved brush smoothing. Any painting tools should now have better smoothing by default. - Transparent TGA import support. - Fix for failures when using compound objects inside groups with Constraints set on them. - Fix for deleting a node of a bitmap fill causing crash. - Fix for combo boxes causing crashes for certain users on High Sierra. - Fix for exporting JPEG automatically choosing to export clips as paths which is a poor default and causes confusion. - Fix for text objects being created outside the hierarchy of the artboard they were supposed to be created in. - Fix for rotated text bounding boxes being incorrect and for disappearing text following Power-Duplicate. - Fixed sporadic hanging when opening many image files at once. - Fixed crashing bug when exporting certain large PSDs. - Fixed a number of UI memory leaks. - Added special case PSD import code for “SketchClub” PSD files (they should fix this!). - Fixed PSD export of Fill layers. - Fixed UI labels on macOS versions prior to Mavericks. - Assorted PDF export improvements. - Paste and file-drop of PDF format files will now honour the DPI, as per File->Place. - Fix for marching ants not showing on a rotated canvas. - Numerous other fixes and stability improvements. I’ve been using Corel Draw and Adobe Illustrator for years for graphic design and in the sign business. When Corel in it’s infinte wisdom decided to dump support for the MacOS by telling customers to switch to Windows to upgrade, I in turn dumped Corel and focused exclusively on Adobe products. However after Adobe abandon their CSx version license model in favor of an overpriced “Cash Grab“ CC Subscription model, I was forced to limp along with previous versions of Adobe Creative Suite with little to no support from Adobe. After much frustration I decided to try Affinity Designer as the cost the of the program was roughly two months of subscription fees from Adobe. I must say after using the product for a few weeks I am very impressed with what it can do. The hardest part is unlearning to do things the archaic Adobe way. Once you get past that and learn this program, you’ll see it’s much more intutive to a modern OS and you find yourself asking why you didn’t do this sooner. Thus far the only thing I haven’t been able to do (but I assume there is a way in the program to it) is autotrace a JPG or other drawing format to create a rough vector drawing (aka digitizing). That in itself if the only thing I’ve seen I still need to load my older Adobe programs for, but again this program is great. My next step is to download and attempt to dump Adobe Photoshop in favor of Affinity Photo. I am in love with this drawing app what an Incredible bargain! Absolutely blows ‪Adobe Illustrator‬ out of the water in many ways. Has the user friendliness of Freehand but it is much better. I can't wait to see where this program goes in the next year and how the remaining programs in the suite (photo manipulation and layout) will work with it. 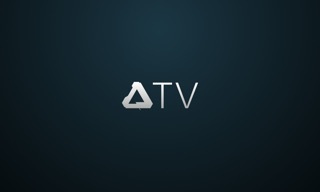 The two Affinity programs work really well together, they have even tighter intigration then the Adobe apps. Managing and finding fonts got way better in 1.6. Canvas rotation is a feature that even Illustrator doesn’t have and is a wonderful addition to a drawing program. Affinity Photo looks to be a very interesting Photoshop / Camera Raw competitor that Design works very well with, in fact it has even tighter intimation then the Adobe apps do. I do have on main complaint with Designer though. I find that working with gradients is more difficult than other drawing programs such as iDraw and FreeHand. For an example if I have a color in the middle that I want to drag to the end this is not so easily done. I would like to think that this will get fixed at some point but talking to the developers they didn’t seem to see this as being a problem. 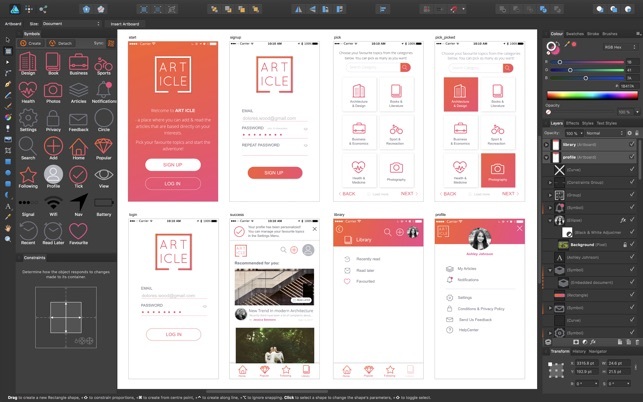 Other then that my interaction with the developers at Serif has been fantastic and they have already fixed some of the problems I had with earlier versions of AD. It still needs some key features before it can replace Adobe -(1) it lacks the ability to replace fonts globaly in a file, so if you’re converting from Adobe, better take good care and look into every detail before sending to press. (2) cannot import EPS files properly - it rasterizes vectors without reason or ability to correct. (3) no “collection” ability for proper filing of your work with placed graphics and/or fonts used. - this is a necessity in the print design world. (4) Does not play nice with Font Suitcase, so if you had used a font and open the file later and that font is no longer loaded, it defaults, which goes back to the inability to replace globally. Baing able to handle fonts is a HUGE factor in the graphic design industry - and should be in the top 3 things that should be addressed before I can increase my stars opinion or even consider it a viable application against Illustrator in the slightest. To the apps defense, it does do a lot with several great features and is lightning fast, which set it apart from Adobe, making it well worth the price. I love the ability to export a PDF to a client or printer that auto flattens/outlines the fonts whereas it doesn't destruct the original working file. But, if you’re a power user as I am for print work, it needs better support for the print design side of things to fully replace Illustrator.